Lower Division Clerk : 12th Class Pass or equivalent from a recognized board. Trades man Mate : Matriculation Class Pass or equivalent from a recognized Board. Sector: Government | Sashastra Seema Bal – SSB | Location: All India | No. of Posts: 355 | Qualification: Matriculation & Sports Quota | Last Date: Apply before within 30 days from the date of advertisement in the Employment News. Sashastra Seema Bal (SSB) invites Application for the post of 355 Constable (GD) under Sports Quota for the year 2016-17 & 2017-18. Apply before within 30 days from the date of advertisement in the Employment News. Border Security Force (BSF) invites application for the post of Constable (General Duty) in CAPFs & AR in State J&K. Apply before 02 September 2016. 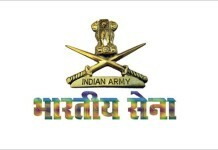 Indian Army invites Application from Male candidates as 20 Havildar (Surveyor Automated Cartographer) in the Army. Apply Online before 10 June 2016.